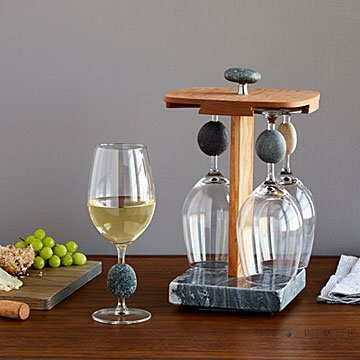 Present your stemware in earthly, polished style with this spinning glass caddy. Why should the vintage get all the spotlight? Present your stemware in earthly, polished style with this spinning glass caddy. Highlighted by stone detail, this centerpiece-worthy design offers a sturdy granite base and rich wood detail. Perfect for bringing the wine from table to countertop, this chic caddy features a stone knob on top for easy transport. Handmade in Windham, New Hampshire. Wipe stand clean with cloth. Hand wash glasses. I ordered these glasses a couple of weeks prior to her birthday and I knew that she was gonna fall in love with them..and she DID!! They are beautiful and each one has the name of the creator on them. Each on is so unique and that is what me love them at the first look. They are VERY delicate making us a little selfish about who uses them ;) but my mother LOVES to show them off. They are absolutely wonderful and I could not thank the creators of these glasses enough for not only making a beautiful product but also giving back to nature while doing so. Fine job! !